The 2008 Beijing Olympic Games have long since passed, but memories of the event hold a special place in the minds of many Chinese, for whom the Games were a triumph, and a source of great national pride. At the now-abandoned Olympic stadium, the games they never wanted to end live on. The underground line which connects the Olympic stadium to the centre of Beijing was constructed especially for the Games. Now it’s practically empty. The journey from the city centre takes around half an hour. Upon arrival, the tunnel leading away from the expansive subway station feels like an entrance into the stadium itself. You can almost feel the long-ago applause and the fanfares. But the only audible sound is that of the wind, which whistles in the abandoned stairways. On this September day, barely anything is happening at the stadium, or on the neighbouring Olympic Green Beijing, which, just like the subway line, was created especially for the Beijing games. Echoing the guiding principles of the Forbidden City, aligned in accordance with Yin and Yang on a North-South axis, this Olympic site is heavily imbued with meaning. A symbolism, which highlights the importance of the Games to the Chinese people. A breeze blows, lukewarm yet steady. There is an occasional whistling as the wind forces its way through the immense metallic structures on all sides – from the national stadium, once fondly dubbed the ‘Bird’s nest’, to the swimming centre, the archery range, the entrance to the Olympic Sports Centre subway. The Olympic Green site, which occupies eight square kilometres, is frequently coated with a centimetre-thick layer of reddish dust, blown in on heavy sandstorms from the Mongolian deserts. This occurs year after year, mostly in the summer months.Across the Chinese capital, these desert sands can descend suddenly and cloak the entire metropolis like a blanket, bringing public life in many places to an effective halt. When the air is again clear, it sweeps the dust completely away. Just as it has on this summer’s day. The sky is a perfect blue, the air is clear. As the wind gathers momentum, the Olympic stadium emerges, its former splendour intact. The Summer Games, Beijing 2008, are over forever. Those Games, which put China firmly in the international spotlight for two glorious weeks in June 2008, are now consigned to the history books. 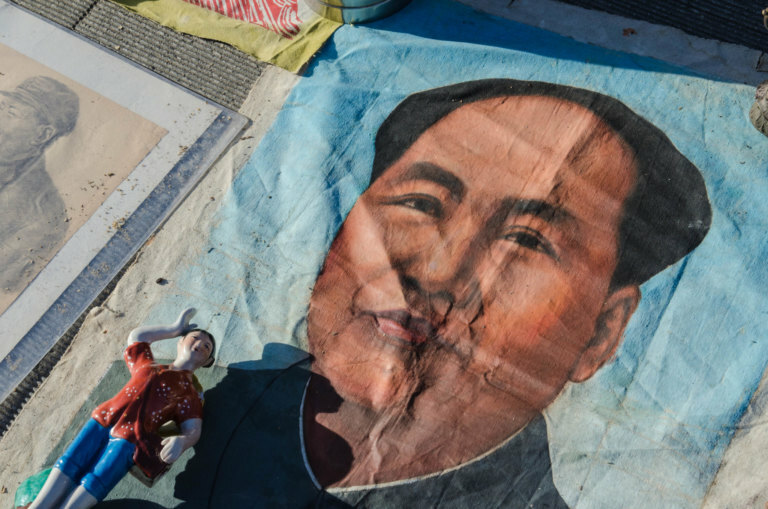 But public interest in China’s Olympic fairy-tale is bigger than ever. Many of Beijing’s 21.5 million inhabitants still refer back to the time. It was a magical moment in history; just as China was emerging as a significant economic power, it hosted the summer Games in the Middle Kingdom with the motto, “One World, One Dream”. The eyes of the world turned to Beijing, where swimming champion Michael Phelps clocked up successive gold medals, a lanky Jamaican by the name of Usain Bolt sprinted into the record books, and the host nation proudly assumed its position at the top of the medal tally. Beijing organised 302 separate events across a series of venues, attracting more visitors than even the Imperial Palace itself managed in the whole of the following year. Just being there meant everything. And for the Chinese themselves? According to a survey conducted after the Games were finished, 62 percent believed the advantages had outweighed the costs. Whether these perceived benefits were financial or otherwise, was not relayed. 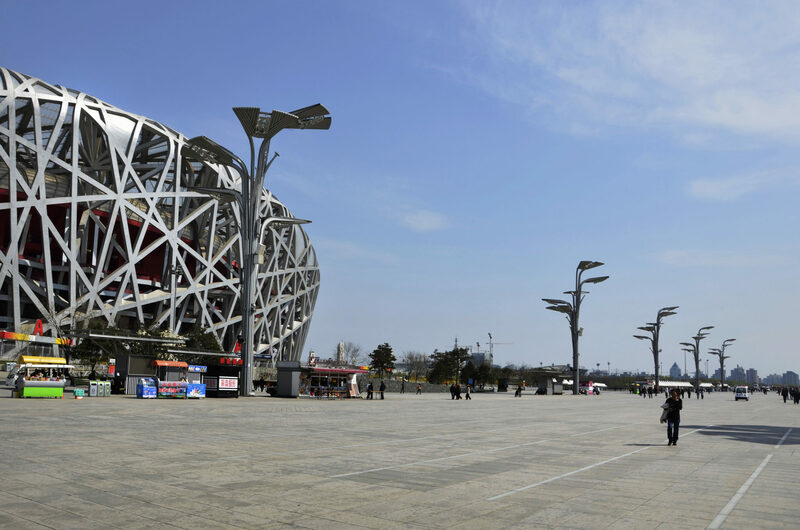 Beijing’s Olympic stadium, the National Stadium, takes pride of place in the centre of the Olympic Park. 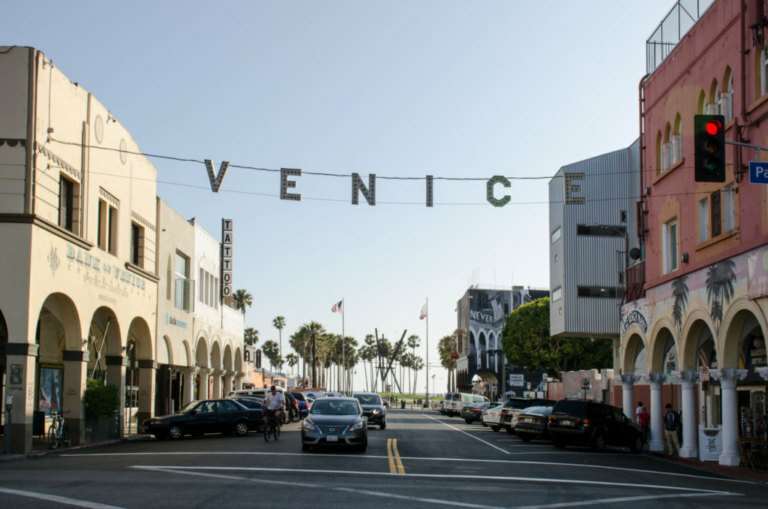 It was quickly nicknamed the Bird’s Nest, thanks to its mighty steel girders, which are evocative of interconnected twigs. 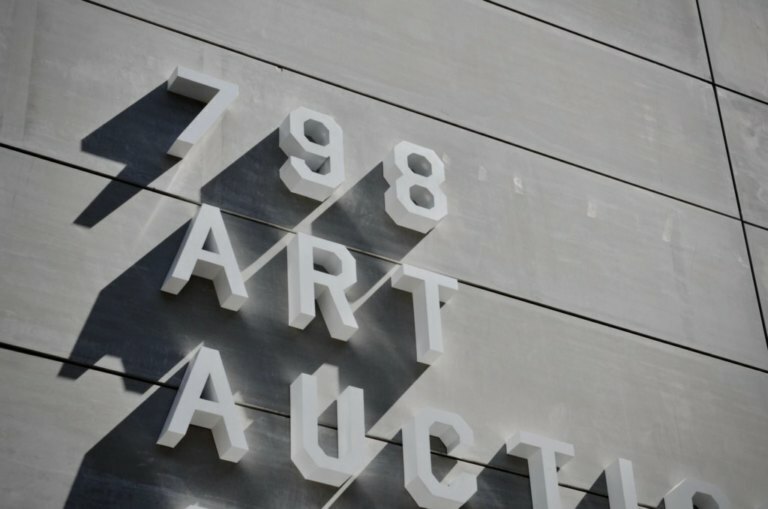 This architectural masterpiece was the brainchild of celebrated Swiss firm Herzog & de Meuron. 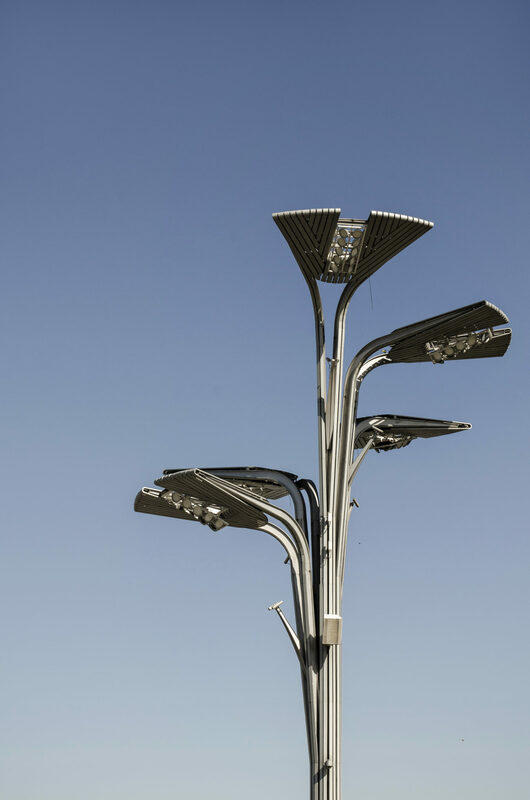 Their vision was brought to life by one thousand construction workers, at a cost of 325 million euros, within just five years – quick, by German standards of construction. Over the past nine years, the Bird’s Nest has remained unchanged. It stands there -steadfast in its perfection – as though the games were still taking place around it. You can almost hear the distant cheering of the crowds. You could be forgiven for forgetting that a decade had passed. It seems like yesterday that the Games finished amid a cacophony of trumpeting and timpani, and these melodies continue to blare like propaganda from the stadium’s insistent speakers. Only in the site’s northern quarter does it begin to resemble a proper garden. The Olympic Forest Park consists of carefully-tended gardens, water features and ornamental ponds, all occupying an area of 680 hectares, almost double the size of New York’s Central Park. Since the Games ended, Beijing’s population has had this public park at its disposal, although the influx is limited. Chinese authorities are keen to preserve the legacy of the Games, so every day, the grounds are cleaned and cared for. This attention extends to the National Swimming Centre, whose iridescent honeycomb facade is regularly scrubbed by hundreds of attentive workers. How expensive is the maintenance of Beijing Olympic Green? Beijing’s Olympic Stadium, with its capacity of 91,000, is equally well-maintained. This was the scene of the athletics competition and football finals, as well as the opening and closing ceremonies. And whilst the stadium stands empty, the grass pitch in the Bird’s Nest is regularly watered and attended to, resulting in a lawn of such quality that any Bundesliga team would be proud to claim it as their own. One wonders whether its condition is due to the care of its groundsmen, or merely due to the fact that it is never used. Few sporting fixtures take place in the former Olympic stadiums, raising questions about the cost of their ongoing maintenance. 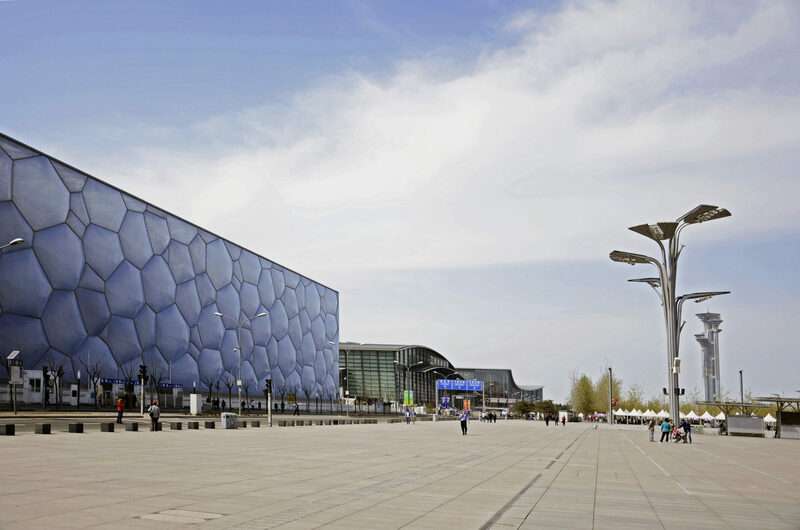 According to the official line from the Olympic Green’s management, various small events such as concerts and the Beijing marathon are set to bring in €1.6 million annually, enough to cover the costs of maintaining the site. This seems somewhat doubtful when one considers the vast expanse of empty and unused facilities, the endless train carriages without passengers, the vacant corridors and secured barriers. 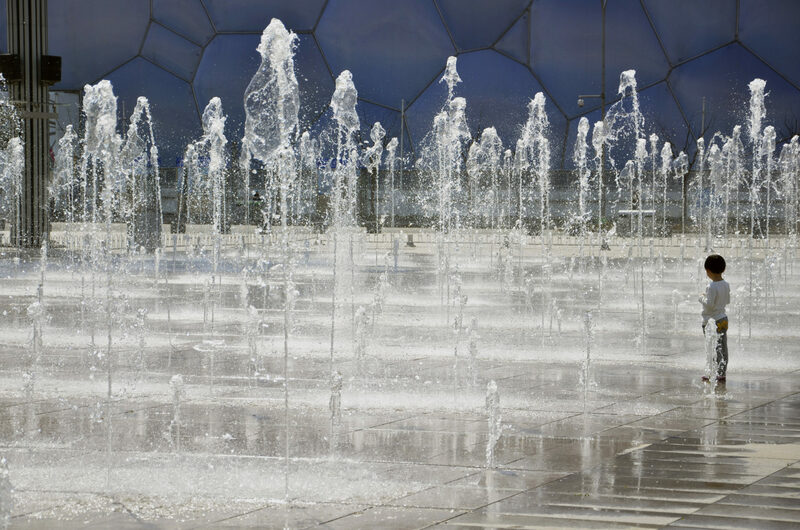 Outside the Swimming Centre, a splash of water bursts intermittently from the concealed water feature in the paving. The water catapults itself into the air, then artfully descends a couple of meters away, forming a mobile arch. A little girl watches, squealing in delight. Her mother stands nearby, emotionless, but with her camera always at the ready. Further along, an electronic sweeper weaves its way over the sheer nothingness of endless concrete slabs: occasionally plastic bags are sucked in, or Coca-Cola cans swept aside. Its operator stares blankly at the horizon, whilst a sponge at the rear of the machine leaves a damp trail in its wake. Then to the west, a memorial celebrates the Olympic victors of yore. Their names are engraved in large letters in the stone – among them Phelps and Bolt. Relics of bygone records and unforgettable moments in time: the true legacy of the games. For a short time, another event brought the Olympic Park back to life: the World Athletics Championships. For a couple of weeks in the summer of 2015, the visitors came back. Although not in the same numbers as before. For now the Olympic Park stands abandoned, but in a few years this is set to change. In 2022 the Winter Olympics will descend on China’s capital. So Beijing 2008 is to be followed by Beijing 2022. China’s dream of an endless Olympic Games will come back to life, as Beijing hosts the Games for the second time in just 14 years. The Olympic Green Beijing will be reinvigorated by throngs of spectators and the Bird’s Nest will once again provide the backdrop for the Opening and Closing ceremonies. The applause of yesteryear will echo once again. And perhaps they will return: those never-ending cheers and fanfares of Beijing. Wow I remember seeing this on the tv at the time and thinking how amazing it was! I would love to see it with my own eyes!! I do enjoy watching Olympic Games. Personally I haven’t been to Olympic site but I never thought about the after the event to maintain the place. I didn’t know about to after I read it. Thank you for sharing! I used to watch the Olympic games when I was younger, but I think after it being in ATL I was a bit spoiled and said to myself as an adult I want to experience it in person. Maybe just maybe I can get to China in 2022. Hi Melanie! Thanks for your kind words. Yes, definitely an amazing experience! It would be nice to visit this place and explore all the different areas! I’m sure it’s going to bring lots of memories from the Olympics. It’s really magnificent! Hey Carol! Yes, definitely, it’s worth visiting. Thanks for your comment! 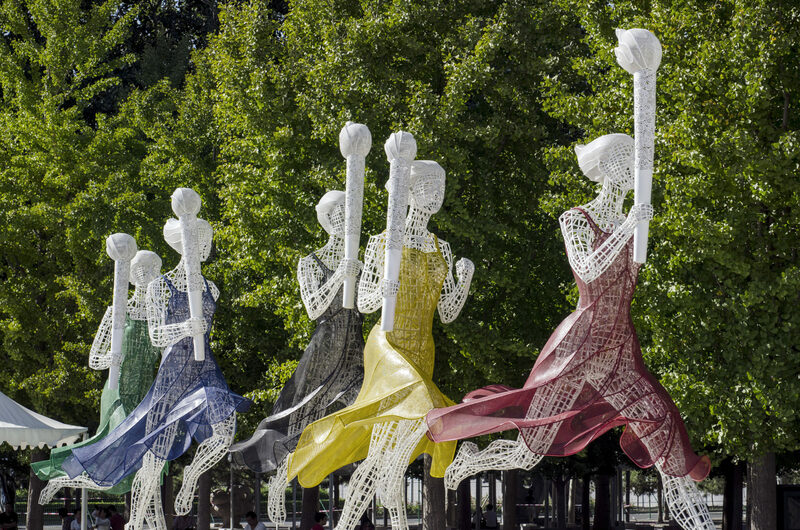 Stunning, I like the sculpture of the 5 ladies running with torches in the Olympic colours. Really pretty ! I haven’t watched the Olympics in a while but I do remember happy memories associated with watching it when I was younger! Have you ever thought of turning your travel narratives into a book? You always write so eloquently and your images are stunning too! How artistic does the stadium looks!? It must have been so wonderful to see it with your own eyes. Beijing Olympic stadium was an amazing construction and great to see its still in good condition even if its not in any real use today. Unlike the Olympic stadiums in Athens or Rio . 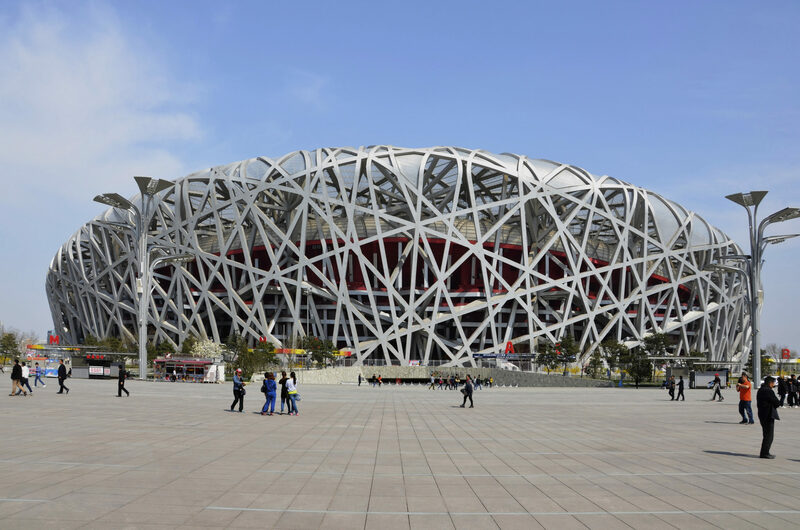 I have not been to China but I would definitely want to see the marvel of construction that is the Bird’s Nest. It really is something to behold and I am happy to see that the various Olympic landmarks are still being maintained. My home city bid for the 2004 Olympic games for the first time in the 1990’s and had to build a number of event spaces before the winner was announced. Regrettably many of those went unused or were vandalized over the years. The architecture is superb! I don’t know a lot about the Olympic Games but I’m sure this stadium can host much more mega events and bring in more tourism to China. The olympic stadium is truly a work of art. I still cant get over the design work and just the sheer size. After the Olympic games that were help here on 2004 many of our stadiums were abandoned. It was sad in our case to see the demise. This stadium looks great I hope your country will explore it better than mine. Beijing Olympics was one of the well executed events in the olympic history. It will be nostalgic to recollect those memories. I appreciate the efforts of Chinese govt, officials and others for constructing these architectural wonders to host the event. Wow! It’s truly amazing. I wonder how it would have been like at the time when Olympics were held there. It would have been truly mesmerizing. I love the overall design of the Beijing’s Olympic Stadium. It seems like a nice place to visit and take some photos. This is a very informative piece about Olympic Park in Beijing. I hope they will allow the public to use the facilities so maintenance costs will be worth it. I’ve been to Korea’s Olympic Park and I must say that it’s quite the same. However, their facilities can be used by their athletes. Beside the installations, the Olympic park has a lot of greenery. It’s truly amazing. I love the architecture of the Beijing’s Olympic Stadium. It seems like a nice place to visit and take some photos. Thanks for sharing. Hey there! Yes, you’re right. Definitely one of our favourite spots in Beijing!